There have been many positive reviews of the National Portrait Gallery’s ‘Sargent: Portraits of Artists and Friends’, and it’s easy to see why. The exhibition tells us a great deal about the man and his work, his approach to his work and his versatility, and about the fin-de-siecle art scene. Many of the portraits on display are of influential people in Sargent’s world: other painters, patrons, writers, society figures and so on. 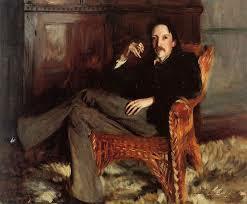 Sargent was deeply interested in literature and music as well as art, so these are also represented here. In the paintings, it’s often (though not always) the case that the figure could be present before you, so strong is the impression given – for example, in the wonderful portrait of Rodin, who I wanted to outstare in order to penetrate his thoughts. Yet this is no photographic realism, but something much more subtle; it somehow manifests the sitter’s – and artist’s – spirit, giving the viewer a sense of personality by the power of the portrait. ‘Sumptuous’ is the rather clichéd word I would use for many of these paintings: in the backgrounds, the fab rics, the glimpses of flesh, the clothes, the women’s hair and the men’s impressive beards. Yet there is a sense that the artist is (mostly) not idealising his sitters and their settings, but representing them through his own idiosyncratic painter’s eyes. This is evident in the unsmiling children of ‘Portraits de M. E.P. et de Mlle. L.P.’ – it seems to me that this is less idealising the children than painting them as they were – refusing to smile when asked, perhaps, as children do – and it makes for an arresting image. The exhibition demonstrates how his work crosses artistic boundaries, then, in terms of his engagement with a broad spectrum of the arts, but also in terms of artistic style. Many of his paintings, particularly in the ‘Student Friends and Young Artists’ section show elements of Impressionism in his work, in the brush strokes and loose repre sentational style. ‘Roman Subercaseaux in a Gondola’ shows us a very different Sargent to that of his most famous portraits such as ‘Madame X’ (which isn’t here). The life and movement (and implied sound) of ‘Rehearsal of the Pasdeloup Orchestra at the Cirque D’Hiver’ also recalls the lively social scenes of Impressionism. Two portraits of Monet are included here, and they are strikingly different and suggest his boldness: in one, his features are portrayed starkly in relief as he looks away from the viewer, in as unImpressionist a painting as one could imagine, while in the other, of Monet painting, the style reflects – or even parodies? 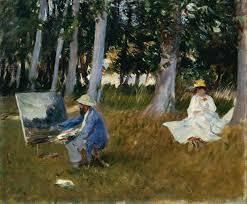 – Monet’s own work. The showstoppers are the large, famous paintings such as ‘Dr Pozz i at home’, an ecclesiastical style painting of the gynaecologist looking regal (and not at all domestic), and ‘Carnation, Lily, Lily, Rose’, described as his ‘masterpiece’ – though I can see it is a painting in which Sargent’s international mix of styles reaches a sophisticated climax, I must confess that as a painting I find it a little cloying and not to my taste. 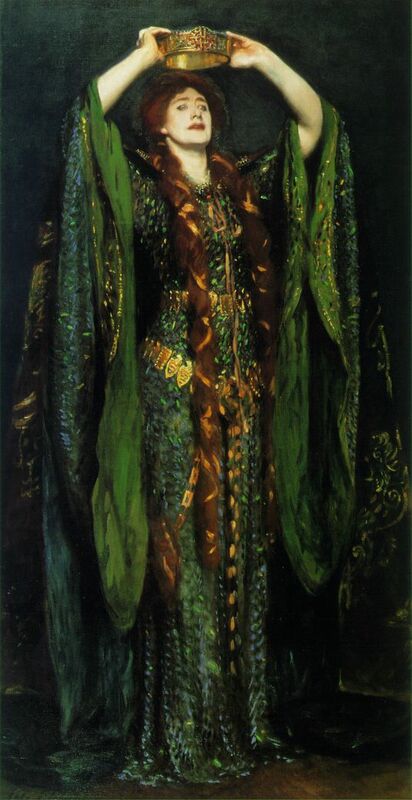 To my mind the paintings to which I want to return are the spectacular, Pre-Raphaelite-influenced ‘Ellen Terry as Lady MacBeth’, even more spectacular and frightening in the flesh (paint), and the marvellous portraits of Robert Louis Stevenson, showing a Mr Hyde side to his character in his compelling, somewhat scary eyes. In one portrait he is sitting staring enigmatically at the viewer, and in the other, in a display of barely repressed energy which prickles on the canvas, he is walking away from his wife (who is unaccountably sparkly). 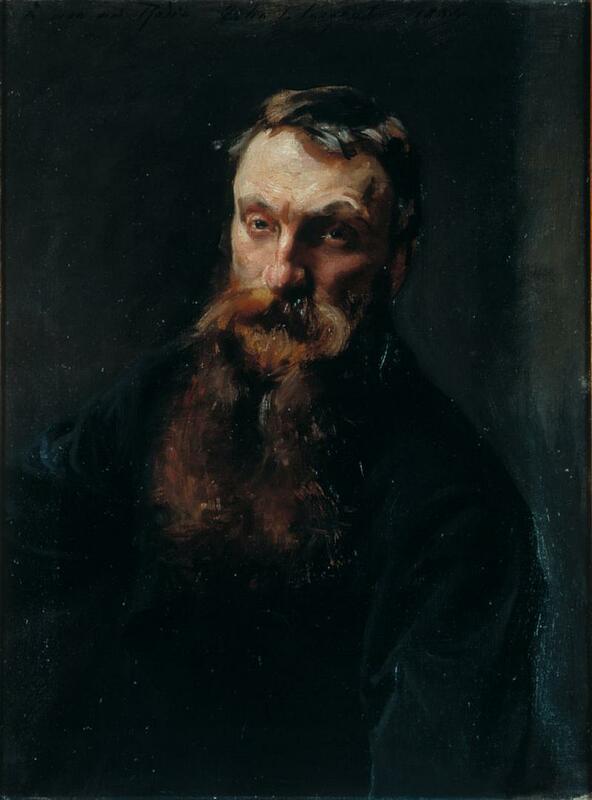 The painting gives the impression that he is excitedly discussing an idea, and cannot contain his enthusiasm; the portrait looks like a photograph in its construction if not in its style. The exhibition demonstrates how Sargent’s life and work crosses boundaries, then: across continents, across artistic forms, across styles and movement in painting. Old and new appear: Sargent’s work seems in many ways poised between the Victorian and the modern, looking both forward and back, and his portraits, of the up-and-coming (such as W. Graham Robertson) and the grand sages of the passing era (Edmund Gosse, Coventry Patmore) reflect this not just in their subjects but in their styles. Women dominate, however: looking around the gallery, they are the large, bright, flamboyant figures, not just beautiful but also fierce, strong, dramatic. There are many exceptions, of course, including ‘Dr Pozzi’, and I don’t want to draw simplistic conclusions, but many of the men are sombre, suited, stuffy, even: his interest in female beauty and strength is as apparent as his enthusiasm for the drama of power. Perhaps the line Sargent doesn’t cross, though, is that of class: the paintings are mostly of the successful, the famous and the well-to-do. This exhibition tells us a great deal about Sargent, though perhaps not the full story (there are few landscapes, obviously, in an exhibition of portraits) but these paintings give us a marvellous sampling of the range of his talents.